The research should be useful for prospective homebuyers and businesses in the housing industry interested in comparing effective property tax payments across narrowly defined geographic areas. An “effective property tax rate” is simply the amount of property tax paid divided by the value of the home, thus giving an apples-to-apples comparison of true tax burden for homes in various locations. The alternative to an effective rate measurement is to compare statutory tax rates, which can be misleading given differences in assessment rules, tax credits, and other complicating factors. The report presents tables of effective property tax rates for more than 3,100 counties, mapped above, and also discusses factors that help explain differences in those rates. It finds that effective property tax rates often appear to be related to household income, the value of homes in the area, and how recently those homes have been sold. The data reveal wide differences across counties, with median real estate taxes ranging from around $110 per home in several Louisiana parishes to more than $8,000 per home in Hunterdon County, N.J., and in Nassau and Westchester Counties in New York. Similarly, real estate tax rates display a wide range of values, from less than a dollar per $1,000 of value in two Alaska Census areas to around $30 per $1,000 of value in several New York counties. Drilling the data down to the smaller geographic confines of Census “tracts” — small subdivisions of a county with populations between 2,500 and 8,000 — the data show that even within counties, effective property tax rates can vary significantly. 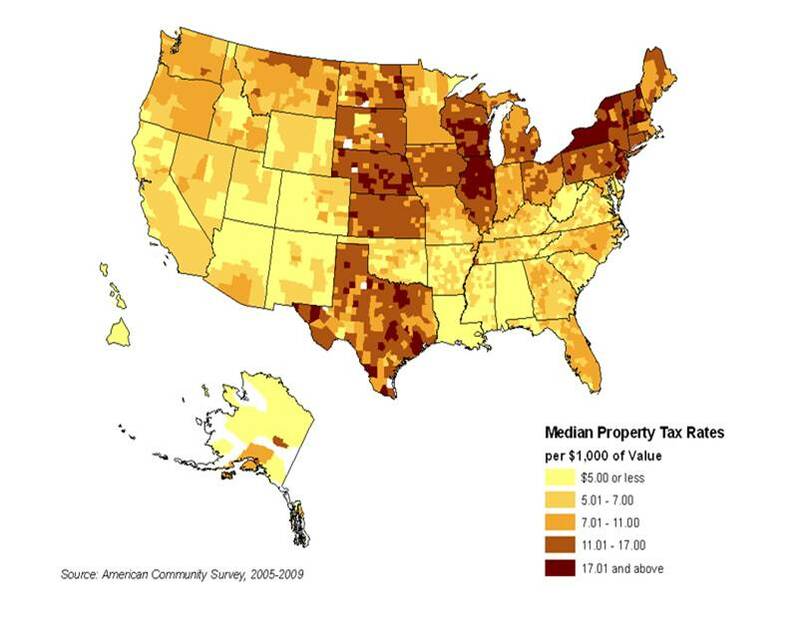 As expected, a large portion of inter-tract differences can be explained by their regional location, with tracts located in the Midwest, Northeast and Texas paying considerably higher property tax rates per $1,000 of value, compared to tracts in the South and West regions. As the report notes, this is a reflection of a well-known and long-established tradition in which southern states tend to rely less on real estate taxes as a source of government revenue. As noted, despite dramatic declines in housing values, homeowners continue to pay about the same nominal level of property tax payments, thus leading to higher effective tax rates. This is due to lags in accruate assessments by taxing jurisdiction, but also out of necesssity due to declining sources of state and local tax revenue during the recession.